This Baked Potato Recipe is always a treat, as a side dish or a quick meal. The secret is picking the correct type of potato for baking. It’s better to choose potatoes that have thick skin, like Idaho, Yukon gold or russet. These potatoes have a starchy interior that becomes flaky and fluffy when baked. The skin is loaded with vitamins and minerals, so if you wash them properly you may eat them as well. As far as toppings, there are infinite wonderful possibilities of enjoying your baked potatoes, from vegan to vegetarian to full-blown meat lover. 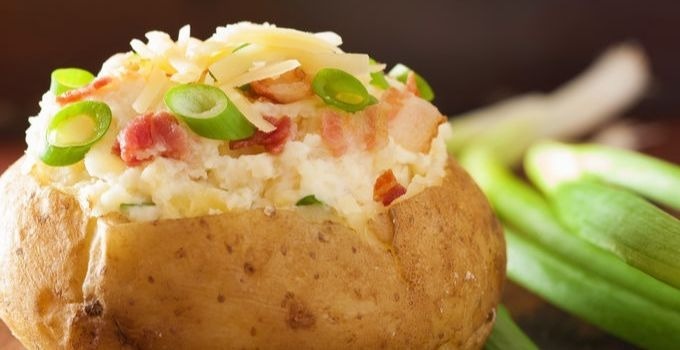 A baked potato with the right topping can be a meal in itself, great for a night snack or a light dinner. Also, it makes an amazing and healthy side dish for meat or poultry. To serve, cut a slit on the potatoes and fill it with your favorite topping.